We know the regular Skateboards from a long time. These are also known as long-boards. People use to perform stunts and do different activities while riding the same. With the advancement and use of technology in daily commuters like a bicycle, Skateboards are also coming with motors installed in them that ease the task of a rider. 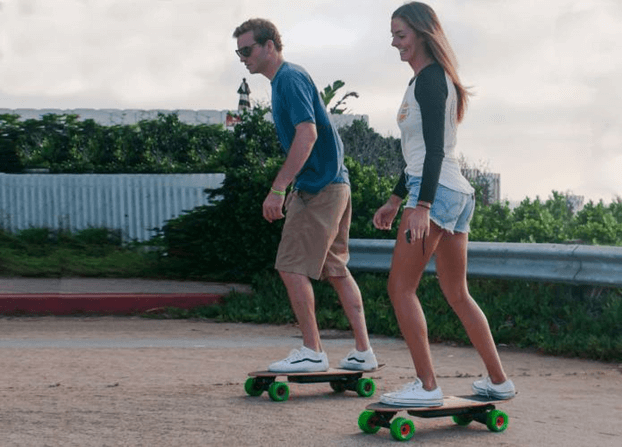 These are popularly known as “Electric Skateboards.” In this article we will be learning "How to ride an electric skateboard" in depth for beginners and experienced skaters. Electric Skateboards are good for a guy who is entirely new to staking. But it also gives a different experience of riding and thrill to the skilled skaters as well. Before looking into the tips on riding an electric skateboard, it is best for us to get familiar with the actual operation of the same. How to Operate an Electric Skateboard? Electric skateboard is having two components, a wireless remote and a motorized skateboard. To operate the motor, you need to give instructions to it using the remote which is a finger-operated trigger having spring resistance. Since electric skateboards can be run and stopped using a motor you first need to be familiar with the speed and to maintain proper balance on the same. You can try with different stances and choose one that is comfortable for you. Once your e- skates are under your control, you are ready to thrill. Take care while stopping the e-skates, prefer to first ride in a straight line and stop it. You can ride an electric skateboard in reverse direction as well, once you apply the brake you can move in the backward direction. If you are trying on skates for the first time, then it is advisable that you should first learn about all the basics of balancing and riding on Skateboard. It can take up to 1 month for you to prepare yourself to have fun on your e-skateboard. Trying an electric skateboard is pretty much similar to riding a skateboard for the first time even to an experienced skater as well. Yes, it’s true, you need to learn to start, stopping and balancing on electric stakes with a different approach. For starting an electric skateboard now, you do not need to apply any force or pump it with your foot. Since it has a motor, this job can be done quickly without any of your efforts. For stopping as well the motor is configured enough to stop smoothly without getting you any harm by falling down or so. However, since it is a motorized stop so to keep it safer for you, it won’t force stop, in such condition you need to use your foot to stop the e-skate completely. Therefore, after a few practices, you’ll be having much idea about how to handle a motorized skate. However, you need to be more cautious while riding electric skates, since they can be run at much higher speeds as compared to regular skates. Always wear knee pads, proper footwear, helmet and shoulder pads, because Safety is most important! I recently bought a skateboard but despite my fondness I am still unable to balance myself and learn how to ride an electric skateboard. I observed that one of all the reasons behind this is that the structure supporting skateboard riding sheet is not well balanced and poorly designed. Its wheels are also behind the sheet which should be wiely spread and tilted at some angle like that in expensive car models. In short, buying skateboard is itself a big deal and then riding it is also a challenege. Yet first thing first.